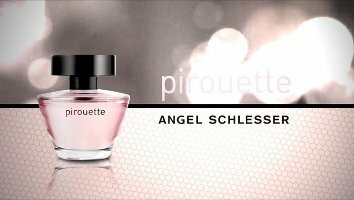 Spanish fashion house Angel Schlesser has launched Pirouette, a new fragrance for women inspired by the world of ballet. The notes include bergamot, black currant, plum, rose, freesia, iris, lily of the valley, orchid, jasmine, cocoa beans, white musk, amber, cedar, vanilla and patchouli. Angel Schlesser Pirouette is available in 30, 50 and 100 ml Eau de Toilette. Speaking of “angels”, a couple years ago I bought a sample of Theirry Mugler Angel. I hated it. I scrubbed it off and threw away the sample. Yesterday, I saw a tester out at Macy’s and decided to try it again out of curiosity, and I LOVED it. Now I’m gonna buy a 5ml rollerball from TPC (cuz a spritz is a little too much, a little goes a long way!) I wish I hadn’t thrown away my sample years ago. Weird how your tastes can change so dramatically. By the way, I’m assuming that it’s been reformulated, since it’s 20 years old now. Does anyone know which is more authentic, the EDP or extrait? Or where I can find vintage Angel? Thanks. I would think so, yes, but no idea which is more authentic. Vintage hunters usually try ebay or old garage sales. I know that nobody loves a nitpicker, but that bottle seems too clunky to represent such a graceful, balletic move. Agree — it doesn’t call up ballet. Well, maybe if you disregard the cap, the bottle itself looks a bit like the tip of a pointe shoe? That’s a bit of a stretch, I realize. Neither the jar nor the juice says “Ballet” to me. Hard to tell from the notes, but wouldn’t have expected the foody notes, yes. Especially because ballet dancers never eat..might make them gain a pound or two..not good, lol. When I think of ballet, I think of a smooth, powdery, jasmine with a touch of a yellow flower, violet, lily for sure..but no foodie or sweet notes. Oh and definitely no patch in a ballet scent, or cocoa! I mean lilacs, lilies, rose, jasmine, and a little pink and warmth so maybe a touch of spice..pink pepper, honeysuckle..those seem like ballet notes..I’ll shut up now..lol.